Password Generator is a perfect tool for creating secure passwords. 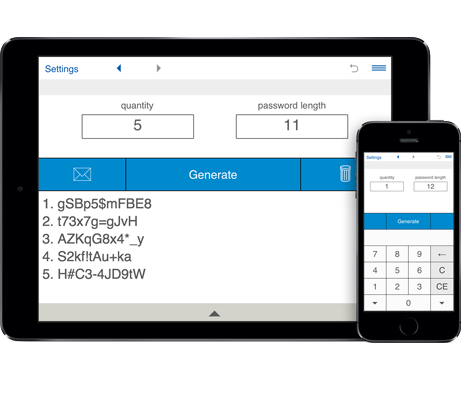 - Password generator lets you generate secure passwords of a given length and complexity using a combination of uppercase and lowercase letters, digits and special symbols. - Creates single or multiple passwords. Password generator can generate up to 200 unique passwords at once. - You can optionally exclude similar characters. Create strong passwords with the online password generator - Free! To generate a password choose your password options and click Generate. This free password generator allows you to generate secure passwords that are difficult to guess because of the combination of uppercase and lowercase letters and digits. For more security you can select to use special characters. Generates random passwords of a given length and complexity using a combination of uppercase and lowercase letters, digits and special symbols (up to 100 characters). Generates up to 200 unique passwords at once. If you generate a list of passwords, you can exclude duplicate passwords. Includes special symbols (!, #, $, -, +, =, _ , @, %, *). You can optionally exclude similar characters. Generated passwords can be sent via email.